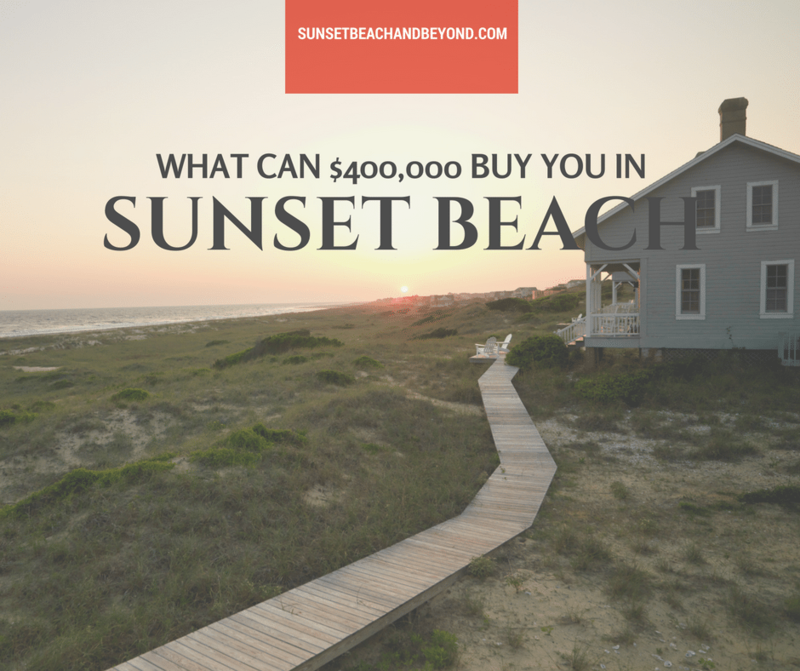 What Can You Get for $400,000 in Sunset Beach NC? Home » What Can You Get for $400,000 in Sunset Beach NC? Considering a move to the North Carolina shores? Sunset Beach makes an ideal place for a retirement, second home, vacation property or permanent beach residence. Currently, as of the publishing of this post, prices are about $173,000 for a median sales price. The price per square foot comes in at about $136. The median price has gone up over the last several years that really peaked in February 2016 up to nearly $250,000 for a median sales price. The price per square foot has gradually gone up over the last five years and we are back to precrisis prices. $400,000 can buy a pretty beautiful home in Sunset Beach. Currently, there are 11 homes for sale priced between $380,000 and $420,000. The majority of homes are on the barrier island side, south of the Intracoastal waterway. Several are in golf courses and there are two condominium units priced from $406,000. If you’re looking for a beachfront home for exactly $400,000 you might check out this a beautiful four bedroom and for bath, 2000 square-foot home with spacious loft, porch area, hardwood floors, stainless steel appliances and two master bedrooms with private bathrooms. This property was built in 2006 and features gorgeous furnishings and coastal touches. If you’re looking to build your own there is a lot for sale at $395,000. This 40,000 square-foot lot is located at 704 S. Sunset Boulevard. Close by at 1006 West Main St. is a four bedroom and two bath home with 1326 ft.² priced at $389,900. Many of the coastal homes only have lots of around 5000 ft.² but many may have beach access. Currently, the closest home to the beach is at 430 Mylan St. offering four bedrooms, two bathrooms, and 1200 ft.². This $399,900 home is a cozy Beach retreat, ideal for a second home, vacation rental, or personal residence. It offers a screened in front porch, carport and a new seawall with dock. Of course, the homes priced anywhere from $200,000 to over $1 million on the barrier island side of Sunset Beach but if you’re looking for a home about $400,000 you have several options to choose from. Would you like a complete list of these properties or other properties that meet your search criteria and price range? Contact us today and I would be happy to give you a customized search result list for homes that meet your expectations.